I LOVE Baseball. I'm no expert.....I can't quote 'stats' or tell you what year who played where, but I'm a dyed-in-the-wool fan who believes in the MLB quote "I Live For This". From April through the World Series every year, I watch, read about, and follow my favorite teams with a passion. Between the end of the World Series and the beginning of Spring Training I miss baseball so much it's like a void in my life. I often fill that void throughout the winter months with reading baseball books and re-watching some of my favorite baseball movies like "Field of Dreams" and "For Love of the Game". My son gets tickled with me because no matter what subject he's discussing with me, something he says will remind me of a favorite baseball story to tell. He can't believe how I relate 'everything' to baseball. This page is a collection of my favorite baseball memories.! My two top favorite teams are the St. Louis Cardinals and the Chicago Cubs. I watch every one of their games I can. I lived in Missouri for 11 years, which is where I became a Cardinals fan, having access to many televised games locally, plus listening to my favorite radio broadcaster, Jack Buck, on radio. 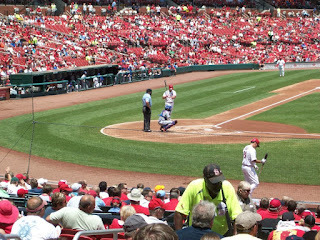 I also had opportunities to occasionally see Cardinals games in person at Busch Stadium, since St. Louis was only a two hour drive away. TV also provided a lot of Chicago Cubs coverage in the Missouri area, particularly on WGN-TV in Chicago, so it was easy to also become a Cubbies fan. My favorite games are when the Cubs are playing the Cards, though it's hard to know who to root for then! I prefer the National League over the American League, because I don't like the 'designated hitter' rule. I think pitchers should also bat, and many of them are really good batters. Since I grew up in upstate New York, that made the NY Yankees a natural part of my world, so I have to add them to my list of favorites. Besides, they have had some of my all-time favorite players on their roster over the years. Anyone else a Derek Jeter fan? Being a New Yorker, I also followed the Brooklyn Dodgers during my teens back in the 1950's1950s. I seldom hold grudges, but I have to admit that to this day I refuse to be a Dodger fan because I never quite forgave them for leaving Brooklyn in 1957. That's a long time to 'hold a grudge'. (Fans can be fickle sometimes!). 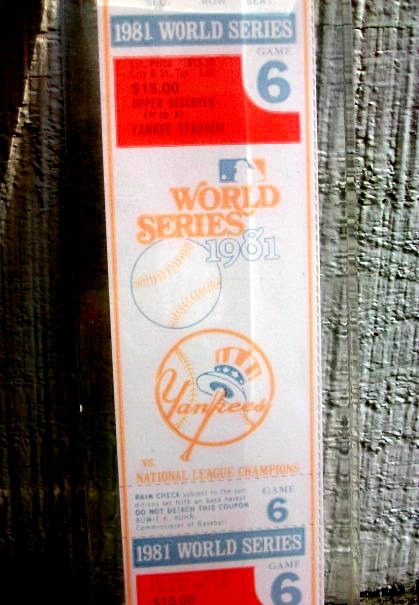 In fact, in 1981 I was living in California when the Los Angeles Dodgers played the New York Yankees in the World Series. We were invited over to our neighbor's house to watch Game 3. Our neighbors were Dodger Fans and I was cheering so emphatically for the Yankees that at one point I was invited to either 'quiet down' or go home to watch the game! (Fans can be rabidly loyal). *Side note: those darn Dodgers ended up winning that World Series after losing the first two games in New York at Yankee Stadium! There's nothing more thrilling than being there in person! I've been fortunate to have been able to attend several games in person in two ballparks - Busch Stadium (St. Louis Cardinals) and the KC Royals Kauffman Stadium, and go to one World Series Game - the opening game of the1985 I-70 World Series between the St. Louis Cardinals and the Kansas City Royals - the thrill of a lifetime to this baseball fan! My dream would be to visit every one of the 30 baseball stadiums to watch a game, starting with Wrigley Field in Chicago! This revised addition of The Ultimate Baseball Road Trip includes every new ballpark since the 2004 edition. It's the perfect guide for my baseball fan dream trip. It's part travel manual, part ballpark atlas, and part baseball history book. It even includes stories and statistics on each park, each park’s trademark foods, and profiles of nearby sports bars and baseball attractions. There is also a guide to restaurants and the city of each stadium. TV and radio stations become sports affiliates, broadcasting local college and professional sports. Between 1982 and 1993 we lived in Columbia, MO where the TV station Bob worked for was an affiliate for Cardinals Baseball. Each year the St. Louis Cardinals sponsored an "Affiliates Meeting" to thank the stations for their broadcasts and we got to attend approximately every other one. The meeting was usually held in May or June and consisted of several festivities over a two-day period. 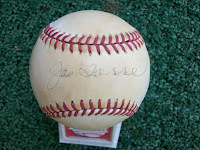 This included a reception, then a dinner, which was followed by an evening game at the stadium on Saturday night, then a Sunday morning breakfast with the Cardinals' Front Office people, and often the manager and a few of the players, ending with an afternoon game. It was always a great deal of fun, a chance to meet people from other broadcasting stations in the network, and the opportunity to meet some of the people behind the scenes for St. Louis Cardinals Baseball. 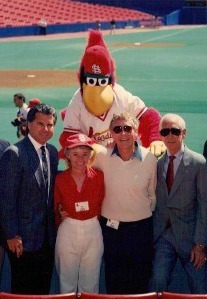 The picture above shows Bob & I at one such meeting, along with Jack Buck, Mike Shannon and others, and, of course, the Redbirds' mascot "Fredbird". At our last Affiliates Meeting before retirement in 1993, the Sunday breakfast gave me another delightful experience in my baseball fan life. I got to meet Joe Torre, who was the manager of the St. Louis Cardinals at that time, and he graciously signed a baseball for me. It's one of my prized possessions! Baseball: "It breaks your heart. It is designed to break your heart. The game begins in the spring, when everything else begins again, and it blossoms in the summer, filling the afternoons and evenings, and then as soon as the chill rains come, it stops and leaves you to face the fall alone." Your passion for baseball is something I truly enjoy witnessing through your posts. That would really be something... attending the World Series. Here's to many memorable and exciting moments during the 2016 season. Enjoy! I DO love my baseball, Diana, and certainly look forward to the 2016 season, as I do every year. In my opinion, baseball is the easiest game to watch and follow what is really going on in the game, but I prefer attending in person. I am not to keen on watching any of the sports (except ice skating) on tv. I think there is something about the stadium atmosphere that adds to the thrill of it all for me. Baseball is the BEST game to watch, not just the easiest. :) Some sports fans say 'well, baseball games move too slow' -- but you never know, right up to the final out, when a fantastic play will happen. To me, it's an 'exciting' game to watch. Yes, I'd love to have the stadium atmosphere all the time, but watching games on TV, when it's your only option, gives me my daily dose of baseball thrills. :) Thanks for stopping by, Mouse. Play Ball!